This morning’s model runs show surprising agreement on the track of our next storm system set to impact the area late Thursday and into Friday. A strong low pressure system is currently digging its way out of California and is expected to move across Southwestern Colorado through the day on Thursday. As it moves across the region and to the East it is expected to close off (intensify in strength) and set up shop right near the Southeastern corner of the state. As with most spring storms, there is still uncertainty with how much this impacts us in terms of snow, we are pretty confident most areas will see significant precipitation. The catch is, without the cold air support, most of this could fall as rain or snow that doesn’t accumulate on the ground much for lower elevations. Currently the thinking is the snowline will be around 5500-6000 feet, which would mean Castle Rock is right on the boundary line. Any shift in temperature (even by a degree or two) could be the difference between several inches of snow accumulation, or none at all. The models are struggling with the rain/snow line, so while our initial forecast is for 4-8 inches now, that amount may change higher or lower depending on where temperatures ultimately end up. Stay tuned here for updates to the forecast! Travel impacts will be most noticeable along the I-25 corridor South of Denver as well as areas West of I-25 into the foothills. Some areas East of Castle Rock into Elbert County may also experience significant travel impacts. 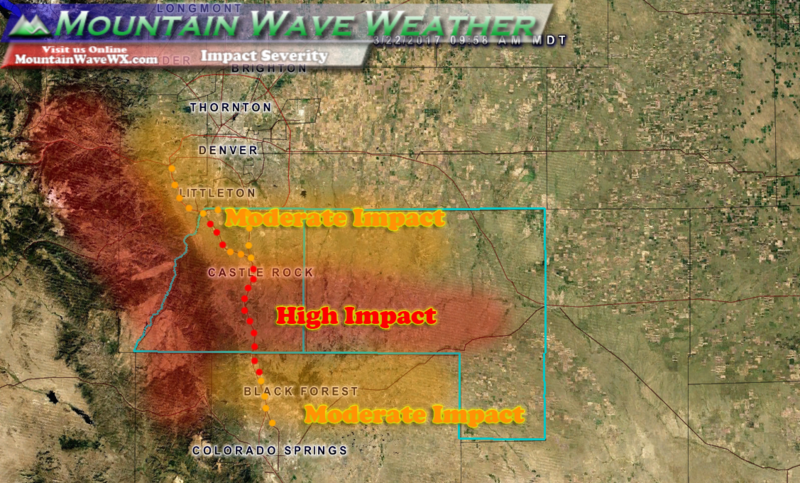 Expect moderate impacts to travel South of Denver along Northern areas of the Palmer Divide. Expect roads to become icy and snowpacked. Strong winds are forecast in the 40-60mph range overnight Thursday into Friday making for possible blizzard conditions. Snowfall could be very heavy overnight Thursday into Friday. This storm system is constantly changing, I’ve put together and assembled some resources to help keep update to date with the latest forecast below. And as always, stay tuned with us for our latest forecast updates and analysis! What are your thoughts out on the eastern plains Fort Morgan area? The Denver Int airport ? Probably looking at mainly rain up in the area. If you do transition to snow up there near Ft. Morgan I’d expect snowfall totals to end up in the 0-2 inch range. DIA currently shows snowfall in the 1-3 inch range at this time. 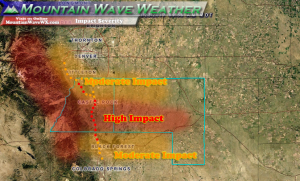 Main impact looks to be western foothills and Palmer Divide with the latest data, I’ll have updates up if that looks like it’s changing!